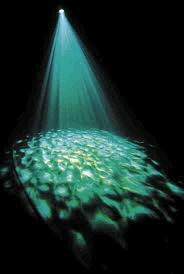 Adds aquatic effect to dance floor or wall or props. 11.5" long, 8.5" wide, 5" tall plus hanging bracket. weight- 16 lbs. * Please call us for any questions on our aqua splash flood light rentals in Ft. Wayne IN, Warsaw, Syracuse, Auburn, South Bend, Indianapolis IN.